When contacting developers to ask about their unreleased games, we often send a barrage of questions to bombard them. Sometimes the answers are pretty short, but other times we can get some brilliant answers which often tell a great story about that time. 1) We currently have you listed as a developer (or one of them) on the following titles: Championship Sprint, Devastating Blow, R-Type and Rampage. Are there any other commercially released titles on the C64 which are missing from that list? I also created a handful of educational games whilst working in Brighton. Then i created some more educational games for whilst living back in Portsmouth for a company in Glasgow called Sketlander. The Beyond Belief games were created in my spare time as I worked as a maintenance man in the Rutland Arms Hotel in Bakewell. I did develop a soccer manager game for Beyond Belief and I think the title was: Jimmy’s Soccer Manager. 2) Did you have any involvement on Super Sprint as well? Yes I was brought in to help David Wainwright code the game. As a little bit of a back story. Do you remember the hurricane that hit the south of the country at the time? Dave and I were working in our office on South-sea sea front (Portsmouth) late at night when it hit the coast. Our first warning was the windows blowing in. We were on the 4th floor of the building and had to make a hasty exit as the building started to shake. We got into Dave’s car and spent the next half an hour dodging all sorts of obstacle such as flying stones from the beach, dust bins (metal ones) even sheets of glass from shop windows skimming along the roads. When we went back to the office the next day our computers were under 6 feet of rubble as a massive Victorian chimney had come down through the roof destroying everything in the office. We contacted Activision to tell them the game would be late and they did not believe our reason. One of the Project managers from Activision (Stuart Hibbert) came along to Portsmouth to see if we were lying and was astonished that we had survived. From that point on Dave and I worked at Activision’s office in Southampton to get it finished. 3) Do you by any chance know who composed the tunes? 4) You’re currently down as being the coder of Devastating Blow for Beyond Belief, which seems to be some gap after your last title. What got you involved with Beyond Belief after all that time? As I mentioned earlier I did a couple of games for Beyond Belief and I can’t really remember how I got involved with them. I think it was friend of a friend who knew the guy who owned the company and got us in contact. 5) A bit of a long shot whilst on the subject of Beyond Belief, but a number of other titles were due out from that company with a developer known only as “The Ghost” – I don’t suppose that was an alias for yourself was it? 🙂 Or if you know who that may have been? It might have been me (it rings a bell). My memory was never that good (childhood nickname at home was Absent Minded Professor). Plus all the partying I did in the Activision years had an effect on my memory as well. LOL. 6) I loaded up Jimmy’s Soccer Manager, and it is credited as a conversion by “The Ghost”, so i’m guessing that this must have been your alias at the time! So that must mean you also converted these two? 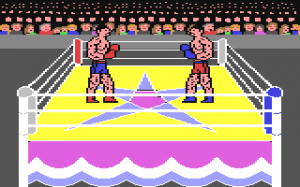 As far as ‘The Ghost’ is concerned I did not do the other games and I have some really vague memory of it being a universal alias the guy was using at the time for more than one of us. I did do some of the Hooray for Henrietta games on the 64 and might have done some on the Amiga as well (not sure but rings a bell). 7) As it’s been documented, R-Type was a bit of a nightmare – but you mention that you have fond memories too (which I’m glad to hear!). Were things very different in the early days of its development? Yes things were very different. All of us that were working on R-Type (various computers) became quite close and were more like a group of friends instead of work colleges. 8) When did you notice things were starting to hit issues, and can you recall what they were? It was about halfway into getting the sprite multiplexer working. The problem was that an awful lot of the things moving around on screen were AI controlled and would change position according to you ships position. e should be as close to the original as possible and were under the illusion that the c64 was as capable as the arcade machine (not!). This meant that I was under constant pressure to make it do things that were not possible. 9) About a decade ago, we managed to recover many levels from your conversion (we’re still not sure how they ever got sneaked out) – Level 3 seems to be missing the large ship (which James confirms was never started). The ship on level 3 was started by me without James knowledge. I can’t quite remember how far I got with it. I’m reasonable sure that I have the source code in a box tucked away somewhere with my old c128/64. I will try to locate it in the next couple of days and see what is salvageable. I do remember that I had 7 disks ( a level per disk) on the go. 10) Did you have any idea at the time that Activision had got the Rainbow Arts team working on another conversion simultaneously in the last 9 weeks or so, or was this a surprise to you and James? It was a surprise as the game that was released was Katakis with some new graphics applied. The idea that they wrote the whole game in 7-9 weeks is rubbish. 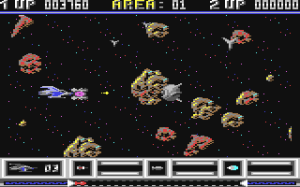 Activision sued them because the game was (apart from graphics) nearly identical to R-Type in the first place. 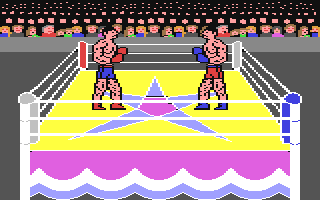 11) Do you have any other memories or recollections about your time on the c64 that you might be able to share? I do remember that many of us working on the c64 at the time would share knowledge and new tricks that we had figured out. I also remember that whilst at Activision myself and Michael Archer would take great pleasure in working out how to do things that programmers from other companies would tell Activision were not possible. For instance 3 player mode in Rampage (the first game ever to our knowledge that could do it). 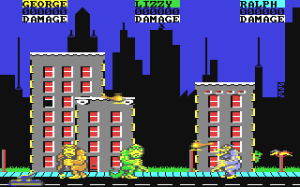 Plus Rampage was around 100k not 64k and used a real time decompresser that Michael Archer wrote. We also told the guy (can’t remember his name) who wrote International Karate how to access the memory tucked underneath the video chip. (Around 4k if I remember it correctly). 12) After R-Type, what was next for you? I did work on a view from above all directional scrolling basketball game for Activision that got canned along with a lot of other game at the time. I think this was around the time that the industry was changing into the movie making style it has now. I had gotten tired of the way we were being treated by then and went back to working on building site doing various jobs. After a couple of years I was unemployed in Portsmouth and came across an advert for a c64 games programming job in Brighton and moved there for it. I wrote quite a few educational games whilst there and taught a few people how to code the c64. I have had many various jobs since then such as Maintenance man, Crane banks man and double Glazing fitter to name a few. I then ended up living in Chesterfield and started freelance programming for a company called Walkgrove Ltd creating e-Learning on PC’s. To cut a very long story short. I am still creating e-learning which I being used throughout the country in schools and colleges. I am also heavily into 3D printing and have a couple of my own printers which enable me to design and create all sorts of things from toys for the grand children to tools and replacement parts for things around the house. I am also listed on several 3D sites (hubs) that bring in some bespoke prototyping work. 13) One final thing I just wanted to check – that Basketball game you did for Activision. It wasn’t actually a Volleyball game called Ace Attacker was it? Based on a SEGA coin-op? Bloody hell! I think you might be right. The name absolutely rings a bell big time. Told you my memory was shot. LOL. This entry was posted in Commodore 64, GTW64 news, Interviews. Bookmark the permalink. As well as the games above my brother and I were the first ones to play some of the games made by our dad. When we went to visit him we would sit in the office as young kids an be his testers for the day. 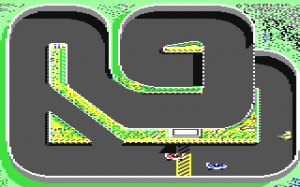 Thanks for sharing Mike – your dad did some great games on the C64! A great set if questions buddy, and a great lot of new information gathered.